The national restaurant “Lička kuća” was built in 1972 as a unique place with an ambience of a traditional house in Lika, in which authentic dishes are prepared and presented to guests. 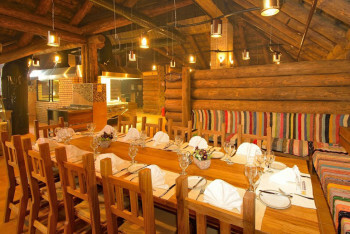 In 2015, the restaurant was fully renovated into the original rustic style of the Lika region. “Lička kuća” consists of two floors with a total capacity of 270 seats. The restaurant is located along the county road DC429, opposite the northern entrance (Entrance 1) of the National Park. In the middle of the restaurant there is an open hearth fireplace, where lamb is roasted on a spit, and where other food specialties from Lika are prepared “under iron cover”. At the restaurant, visitors can see a number of traditional items, characteristic of the former life of families in Lika. The restaurant’s diverse menu includes specialties from the Lika region, prepared according to traditional recipes from local products. Ham, “basa” cottage cheese, lamb under iron cover, grilled meats, baked potatoes, trout, sour milk, the Lika fritters, and the Lika strudels made of cheese, apple or plum, are just some of the specialties of this renowned restaurant.